The Plantronics Encore Pro HW301N is a top-of-the-range binaural headset featuring excellent audio quality and a noise-cancelling microphone for clearer, more comfortable phone calls. It sports a stylish, lightweight design, plush leatherette ear cushions and a high-quality, durable build. Designed with frequent everyday use in mind in call centres and other office environments, this headset offers excellent comfort. The binaural design allows the user to remain completely focussed on the conversation, while a highly effective noise-cancelling microphone helps to block out background ambience, even in noisier surroundings, for clearer, more professional phone calls. The headband and microphone boom are easily adjustable allowing the user to enjoy the perfect fit for lasting comfort throughout the working day. Sporting Plantronics' excellent audio drivers and a sound enhancement system, the Plantronics Encore Pro HW301N combines a unique and stylish design with excellent performance and reliability. 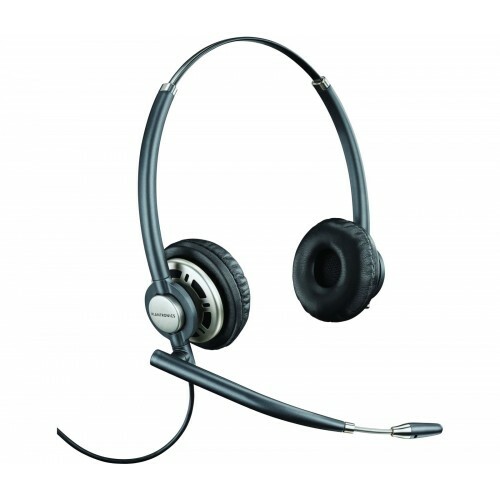 Suitable for use with any VoIP telephony systems, the headset helps to eliminate echo while delivering crystal-clear, wideband audio. With its excellent noise-cancellation technology and binaural design, the Plantronics Encore Pro HW301N is best suited to use in busy call centre environments.